I'm growing weary of this... CLICK HERE And they all seem to be coming out of Latin America where the rare and mysterious mylar party balloon must be like seeing bloody tears streaming from a bust of the Madonna. While this purports to be a Discovery Channel film crew, I am dubious. I would like think they could hold a camera steadier than your average YouTube moron. And I am equally weary of the now classic "it looks like it could be ____ but I have my doubts. I see ____ in the video and ____ that could indicate this is really a ______" Translation: I have a belief structure I don't wish to shake and therefore I will see what I want to see so that I don't have to shed those beliefs. "According to my research, PX, the size of Jupiter, is presently in our solar system and is heading towards Earth. It is in a retrograde orbit. Its overwhelming magnetic properties and gravitational field has catastrophic effects on nearby celestial bodies. A source on the Internet [Oh, thank God there is a 'source' on the Internet to bolster the following statement! CH] states PX will be visible in the Southern Hemisphere in June, 2009. Now it can be seen by satellite or observatory telescopes. As it nears the Earth, its mass, magnetic and gravitational effects will be apparent in severe climate change, frequent and higher magnitude earthquakes and volcanic activity, and other geological disturbances. The projected time of a PX close encounter is the end of 2011 - 2012. I am convinced that PX is a starship inhabited by a hostile race of ETs called the Nefilim; a race of giants that once inhabited Earth during the Sumerian civilization and for thousands of years prior to that era." Not one to be left out of the fast-paced world of baseless proclamations, I will also astound you with what my "research" has uncovered. Some of you may be troubled by the "New World Order" implications of the following, but it seems that through ancient Sumerian texts I have learned that frogs and toads are far better at making swimwear than all the fashion houses combined. So good are they that their increasing mass-extinction threatens humanity in untold ways. A time is coming, with global temperatures rising, that humans will need to seek the cooling reprieve of our lakes and oceans. And where will the frogs and toads be? 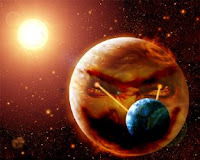 That's right, Planet X (PX). You see, they are not really dying out. Sources on the Internet tell me they are being "beamed" aboard PX, an intergalactic deathstar of sorts since they are the progeny of the 'Nefelim'. Well, you heard it here first kids. I know, I know. As Dostoyevsky said, "Sarcasm is the last refuge of modest and chaste-souled people when the privacy of their soul is coarsely and intrusively invaded." But then, he's like old or dead or whatever. ALIEN INTRUDER CAPTURED ON FILM? A Florida couple claiming to have long been the victim of alien visitations and abductions purports to have finally captured an extraterrestrial on video. Watch the video and decide for your self. While I am not usually a paranoid, conspiracy-driven person, I must say I feel the subtle encroachment of the technocracy when one can view their own home on the Google Street View feature to their mapping software. Read: you are being watched. Well, maybe not you but your house may. What began as handy street maps - often more relevant than the ones you would spend good money on - with driving directions and distances, has now grown to include satellite imagery and now street scans. Not everyone is too happy about Google's new toy. As with many forms of invasive technology, we don't yet know what this may mean to our privacy and safety. Is this unwittingly giving criminals intelligence to select targets more efficiently? Providing them with greater information concerning you and your home? 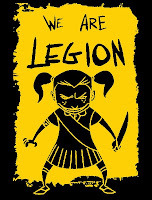 Or worse yet, will those nefarious Girl Scouts now have the tools to send smartly forward their ever-advancing legions of Snickerdoodle Stormtroopers? Calories, girls! Think of the calories!! Perhaps I'm just being paranoid. I recently caught an episode of Unsolved History (God only knows when it aired originally) that looked at three of the earliest and biggest news-making UFO encounters: Arnold's infamous sighting, Roswell, and the notorious Skyhook entanglement in KY.
As a part of this show, which seemed on the surface to be genuinely unbiased yet gave off subtle dismissive vibes, a memory experiment was conducted by a cognitive psychologist to test if those who claim they witnessed events at Roswell may have been prone to suggestion and confabulation. A group was gathered, taken out into the desert, hurriedly shuffled along a path past a tableau reminiscent of the Roswell crash (debris, armed military personnel) and then only questioned about what they had seen once an entire month had gone by. This presumably gave their memories time to stew and get confused with other stimuli. To verify what they had said was true or false, each participant wore a camera mounted on a helmet to show their point of view. When the witnesses were interviewed, it was said, their recollections were inaccurate and colored with all sorts of interpretive perceptions, extrapolations, and false memories. However, on camera, we only see a witness interview with one participant. This makes me wonder if the team at Unsolved History wasn't trying to massage their data, or at least our perception of it. We learn no statistics only the blanket announcement that memory is susceptible to error, given enough time. While this can be true, it also ignores the relevance of eye-witness testimony. If recall counted for nothing, witness testimony would be irrelevant in court. In the end, I came out of the episode with the impression that Unsolved History was unduly satisfied with both their experiment and conclusion. And that overall, it seemed to have an agenda to pursue by forcing this and other inconclusive experiments down our throats like square pegs as if they were the final word on the matter. I'm a firm believer in debunking. Debunk away, I say! I don't, however, approve of sloppy, lazy, self-confident debunking, which I believe this to be. I'd like to extend thanks to the folks at Parazona Radio for having me on last night. It was a great show, with good energy and some great points of view. And to those who endured my ramblings. :-D Going forward, I wish them much success with their show. For those of you unfamiliar with the program, click here. You can catch my interview tonight on PARAZONA where I will discuss my book and forthcoming novel. The Question Remains, Will The Pending Reptilian Invasion Have Horns? I love this sort of stuff. You know, in the way you really can't stand something but you say that you do in a flourish of irony (okay, sarcasm). I would like to say this all reads like good science fiction, but I can't even be that generous. It's the same spurious - and always paranoid - proclamations of the sinister based on illogical, disconnected conclusions or simply born of the ether. A mythological patchwork stitched tenuously together with threads culled randomly from third-hand sources like chatrooms and Fate. The San Francisco Chronicle examines the inexorable demise of the Yeti legend in the small Himalayan country of Bhutan, which until recently had done a good job of keeping progress at bay. One wonders if, in time, a similar extinction will face the various ape-men legends of North America. As hoaxes pile up higher than evidence, and bodies remain elusive, will anyone care in another ten years? Will it seem a quaint fascination of the 20th Century, which bled onto the New Millenium only to die an ignominious death at the hands of, say, Reality TV? Time will tell. This site posits that antigravity was discovered in the Sputnik-era launch of the United States' own satellite, Explorer I. However, they claim, the discovery was quickly quelled by - who else? - the nefarious Government (with a capital G). I, of course, have problems with this. Chiefly, how many scientific discoveries (of worth) have ever been dropped? Think about even the most contentious finds of recent years: stem cells, cloning, biological and nuclear weapons... For moral reasons or just plain old self-preservation each has been under attack in hopes of terminating research into these fields with few exceptions. Yet, the research continues covertly, in other countries, and even by our own government. You can't keep - for better or for worse - monumental, life-altering discoveries down. And an effective way to defy gravity? During the Cold War? Please. More money was thrown at the military complex during the Cold War than before or since. They were wasting it hand over fist on all sorts of worthless inventions with the aim of gaining the advantage. You cannot tell me anyone would have squashed such an enormous discovery with far-reaching economic and military applications. See, it's not enough to have an outlandish theory but you have to have proof - or at least some logic. "Instead, Biscardi said he plans to keep the body at an undisclosed location while scientists, including two Russian hominid specialists, study the creature. Biscardi said the entire process will be filmed and then released as a documentary." 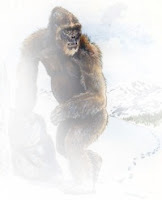 For some pretty damning evidence against the authenticity of the Georgia Bigfoot, click on over to Blogsquatcher where some hidden gems have been uncovered that show a much clearer evolution of this hoax. 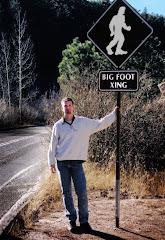 Bigfoot Body Or Clever Hoax? 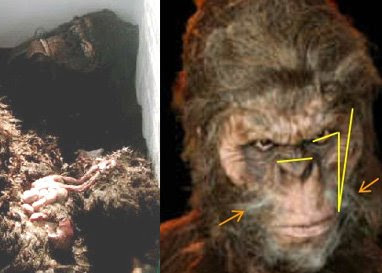 By now, many of you interested in such things have no doubt heard of the purported Bigfoot body found by Georgia Sasquatch hunters, Matthew Whitton and Rick Dyer in the forests of that state. A pending press announcement will make the news official, but in the meantime skeptics and the hopeful are dissecting what scant information exists like anxious children on Christmas Eve. So far, just one photo of the body as it rests in a freezer has been released to the public. The folks at Where Light Meets Dark have an interesting analysis of what this "corpse" really is. Was anyone else less than thrilled by the second film in an otherwise wildly successful franchise? Opinions? 1952 - At 1:30 a.m. radar operators on the ground in Osceola , Wisconsin witnessed several clusters of up to 10 small radar targets and one large target. The small targets moved from southwest to east at 50-60 knots (60-70 mph), following each other. The large object moved at 600 knots (700 mph). One hour total time. The pilot of a F-51 Mustang in flight confirmed a visual sighting of one of the targets. (Source: Condon Committee investigation files; Don Berliner, Project Bluebook UFO Unknowns). 1952 - At 12:30 p.m. USAF personnel near Ennis , Montana were alerted that UFOs were coming from the direction of Seattle , Washington and headed toward their position. Twelve of them saw two to five flat disc-shaped objects fly over. One hovered for 3-4 minutes, while the others circled it. The sighting lasted 30 minutes. (Sources: Project Blue Book files counted in official statistics, case no. 1747; Don Berliner, Project Bluebook UFO Unknowns). 1952 - Langley AFB, Virginia . At 2:30 p.m. USAF Captain D.G. Moore, of military air traffic control, sighted a UFO coming toward the air base that flew at an estimated speed of 2,600 mph below an altitude of 5,000 feet. It was in sight for two minutes. Twenty minutes later Captain Moore and electronics technician W. Y. Hope tracked a UFO on radar moving away. The object stopped for two minutes, then moved away again very, very fast. Total duration four minutes. (Sources: Kevin Randle, Invasion Washington: UFOs over the Capitol; p. 275; Don Berliner, Project Bluebook UFO Unknowns). 1952 -At 3:44 Herbert Mitchell and his employee in Merced , California sighted a dark, discus-shaped object, trailed two lengths behind by a silvery light. It tipped on its side, dove, hesitated, and then circled very fast. They watched it for two minutes. (Sources: Project Blue Book files counted in official statistics, case no. 1738; Don Berliner, Project Bluebook UFO Unknowns). 1952 - In Wichita , Kansas at 12:35 p.m. USAF shop employees Douglas and Hess saw a bright white circular craft with a flat bottom at the Municipal Airport . The object flew very fast, and then hovered 10-15 seconds over the Cessna Aircraft Co. plant. Their sighting lasted five minute sighting. (Sources: Project Blue Book files counted in official statistics, case no. 1739; Don Berliner, Project Bluebook UFO Unknowns). 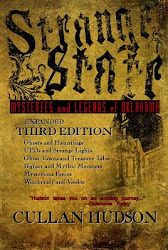 Spellbound stories received a heads up about this documentary, shot by Norman, OK filmmaker David Burkhart. In the feature-length film (of which only a portion can be viewed here), Burkhart attempts to examine not only the mechanics of a now-nototious haunting at the University of Oklahoma, but larger existential themes surrounding death, fear, and loss. While Burkhart's cinematography is commendable, the editing is a bit abrupt at times and his self-narration seems to affect a hoarser, deeper register that walks a thin line between promising documentary and any given episode of Weird Travels. 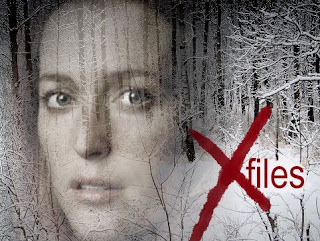 Together with a subtle score comprised of little more than plodding notes from the piano and a haunting synth harmony, the narration takes on an almost Carteresque aspect reminiscent of early X-Files. All in all, I was impressed with the potential this film demonstrates. Its rough, but nonetheless apparent, artistry is what sets it apart from so many paranormal documentaries that take their cues from Ghost Hunters or any of the litany of shows found on the History or Travel channels. However, what most impressed me was hearing how Burkhart abandoned his first impulse of a straight documentary on a haunted location and those who investigate such things (namely Oklahoma City Ghost Club) for a more personal look at the greater themes of life and death. Noting early on in the film that his own father's passing profoundly affected him, it is easy to understand his desire to not only contemplate the existence of life beyond death but to physically face his fears regarding it by filming his solo stay in OU's haunted Cate Center. While still in production, Burkhart's teaser on YouTube is bound to cultivate an audience eager for its release as a feature length film that will invariably tour local and regional film festivals and hopefully find distribution. If you would like to read more about the Cate Center haunting, may I [insert shameless plug] recommend purchasing a copy of my book, wherein I examine the events surrounding this ghostly locale?